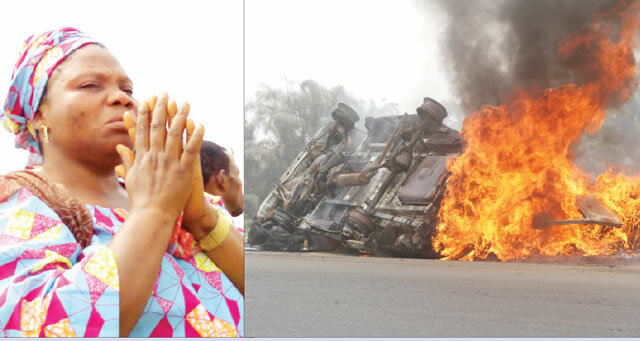 A woman and her driver cheated death by a whisker on Tuesday after their delivery van somersaulted and went up in flames on the Lagos-Ibadan Expressway. The vehicle was heading towards the Sagamu area to deliver some cartons of sausage rolls to customers, when the accident happened around 11am at the Ibafo end of the expressway. It was learnt that the van was on top speed when one of the back tyres burst, and the vehicle somersaulted. The driver of the van said he lost control of it immediately the tyre burst. PUNCH Metro learnt that the accident could have been aggravated due to the presence of a fuel-laden tanker by the roadside. The tanker driver, however, swiftly drove it away from the scene immediately the explosion occured. Men of the Ogun State Fire Service later came to put out the fire, while officials of the Federal Road Safety Corps arrived to control the traffic that had built up on the road.